Gloria Gemma&apos;s annual two-day event, Flames of Hope: A Celebration of Life™ Weekend, returns September 30–October 1, 2017 to downtown Providence. 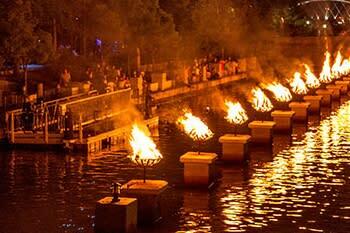 The weekend includes activities for all ages, a WaterFire and more. Below are 10 reasons not to miss this spectacular weekend. 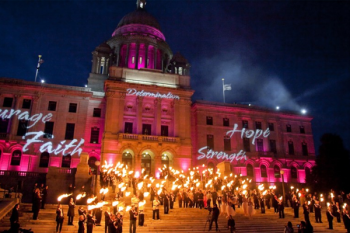 This ceremony takes place at dusk on the State House steps, followed by a torch procession to the Providence River Basin to light the largest WaterFire of the season. This new food, wine and beer tasting is open to guests 21 years of age and older with unlimited tastings. The tasting tent will be open from 7 p.m. to 10 p.m. and is connected to the VIP Pink Party tent located at Station Park. 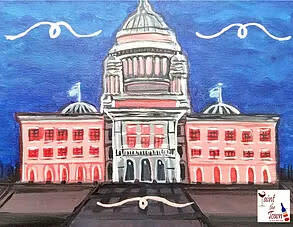 Sip on a drink while you paint your rendition of the pink Rhode Island State House. There will be two 90-minute sessions, one at 4 p.m. and one at 8:30 p.m. Check out this FREE event that makes learning and community engagement fun. Enjoy games, activities and free s’mores. See the Flames of Hope from an entirely different view. Stop by for skin cancer screenings, bra fittings, breast cancer screenings and more on Saturday, September 30 at the Omni Providence Hotel from 8 a.m. to 2 p.m. Free parking is available at the State House with a shuttle to the hotel and a limited number of registrants will receive a bracelet by Gennaro. Providence&apos;s signature event WaterFire is an award-winning fire sculpture installation on the three rivers in downtown Providence. The Flames of Hope WaterFire is the largest WaterFire of the season. Whether you are in it to dash, sprint, run or walk, the Gloria Gemma Run/Walk Series has something for everyone. 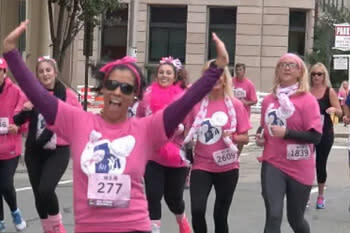 This event includes three races for one great cause and takes place Sunday, October 1 at 9 a.m. at One Providence Place. Head into the city early, enjoy the amazing dining scene, plan a weekend getaway around the events, and take a look at what else is happening throughout the city.